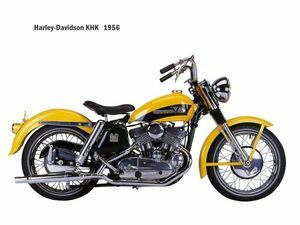 The Harley-Davidson KHK was a mid-sized V-twin cruiser made by Harley-Davidson from 1954 till 1956. 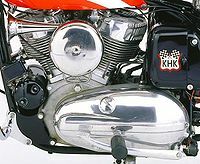 In 1954 the Harley-Davidson K series became the KH as the V-twin grew to 55 cubic inches (~900cc). The KHK signified that the motorcycle was equiped with lower handlebars, less chrome trim and more performance oriented cam-shafts. The KHK series really just served as a stop-gap measure until the next year, 1957, Harley finally was ready to release its OHV Sportster could take its place in the model line-up. It had the same 883cc displacement of the KH motors, but it marked the start of a new product line—the Sportster. The KHK was the last of a breed and aside from the three-wheeled Servi-Car, represents the final flathead motorcycles Harley-Davidson would ever produce.